The Scythian Kurgan Arzhan 2 (Tuva, Siberia), 7th century BC, grave 16 and a view of the unearthed 14 horse skeletons. Credit: Michael Hochmuth, German Archaeological Institute, Berlin. Nomad Scythian herders roamed vast areas spanning the Central Asian steppes during the Iron Age, approximately from the 9th to the 1st century BCE (Before Common Era). These livestock pastoralists, who lived on wagons covered by tents, left their mark in the history of warfare for their exceptional equestrian skills. They were among the first to master mounted riding and to make use of composite bows while riding. A new study published in Science led by Professor Ludovic Orlando and involving 33 international researchers from 16 universities, now reveals the suite of traits that Scythian breeders selected to engineer the type of horse that best fit their purpose. The study took advantage of exceptionally preserved horse remains in royal Scythian burials, such as the site of Arzhan, Tuva Republic, where over 200 horses have been excavated but also at Berel', Kazakhstan, where no less than 13 horses were preserved in a single, permafrozen funerary chamber. Applying the latest methods in ancient DNA research, the researchers could sequence the genome of 13 Scythian stallions. These were 2,300-2,700 years old and included 11 specimens from Berel' and two from Arzhan. The researchers also sequenced the genome of one 4,100 year-old mare from Chelyabinsk, Russia, belonging to the earlier Sintashta culture, which developed the first two-wheeled chariots drawn by horses. 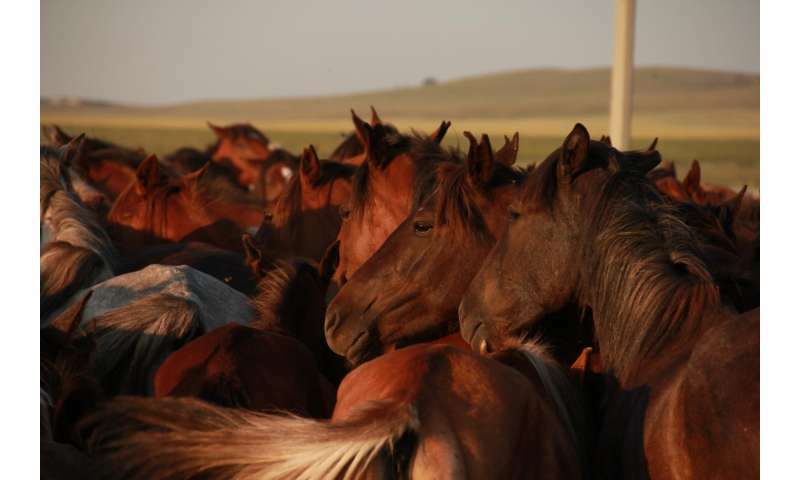 The DNA variation observed at key genes revealed a large diversity of coat coloration patterns within Scythian horses, including bay, black, chestnut, cream and spotted animals. Scythian horses did not carry the mutation responsible for alternate gaits, and as a consequence, were not natural amblers. However, some but not all individuals carried variants associated with short-distance sprint performance in present-day racing horses. This indicates that Scythian breeders valued animals showing diverse endurance and speed potential. "With the exception of two horses, none of the animals were related. It fits with Herodotus' depiction of Scythian funerary rituals, whereby sacrificed horses represented gifts from allied tribes spread across the steppes", says Dr. Pablo Librado, post-doctoral researcher at the Centre for GeoGenetics, University of Copenhagen, Denmark, and co-leading author of the study. 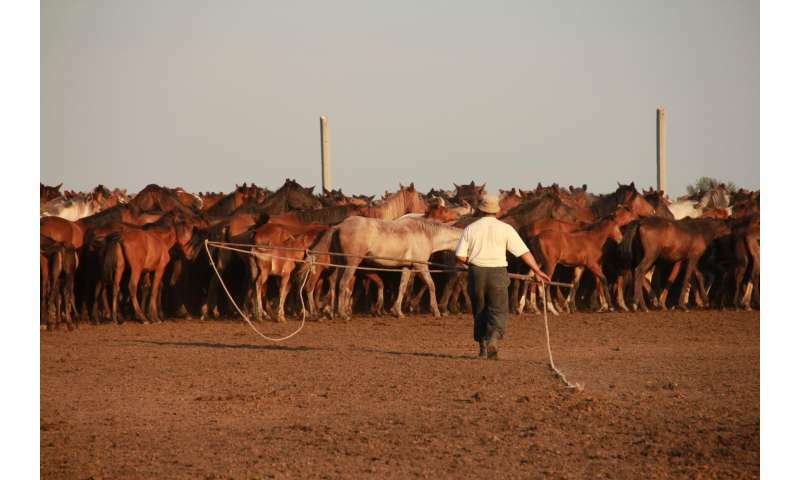 A Kazakh horse breeder catching horses in North Central Kazakhstan. Credit: Ludovic Orlando, Natural History Museum of Denmark, CNRS. Importantly, none of the ancient horses analyzed in the study were inbred, which suggests that Scythian breeders succeeded in maintaining natural herd structures and did not perform selection through a limited number of valuable lineages. This contrasts with modern management practice where single stallions can be used to father hundreds of offspring. Patterns of genetic variation along the genome also revealed a total of 121 genes selected by Scythian breeders, most of which are involved in the development of forelimbs. This is reminiscent of the morphological indices measured on bones, and indicates that Scythian breeders selected horses showing more robust morphologies. "In this study we wanted to go beyond the myth of Scythians being aggressive warriors, drinking the blood of their enemies in skull mugs. We wanted to reveal the many facets of the exceptional relationship that these people developed with their horses," says Ludovic Orlando, Professor of Molecular Archaeology at the Centre for GeoGenetics, University of Copenhagen and CNRS Research Director at the AMIS laboratory, University of Toulouse. The genome data set generated in the study also reveals important lessons for the history of horse management, which started some 5,500 years ago, and animal domestication as a whole. By contrasting patterns of genetic variation in ancient and present-day horses, the authors found support for a significant demographic collapse during the last 2,300 years, which resulted in an important reduction of genetic diversity within horse domesticates. During the same time period, reproductive management has involved an increasingly reduced number of stallions, up to the point that, today, almost all domesticates virtually carry the same, or highly similar, Y-chromosome haplotype(s). "Many Y-chromosome haplotypes co-existed within Scythian horse populations. The first three millennia of horse domestication thus preserved a large diversity of male lineages. It only vanished within the last 2,000 years," adds Dr. Cristina Gamba, post-doctoral researcher at the Centre for GeoGenetics at the time of the study, and co-leading author of the study. Kazakh horses in North Central Kazakhstan. Credit: Ludovic Orlando, Natural History Museum of Denmark, CNRS. 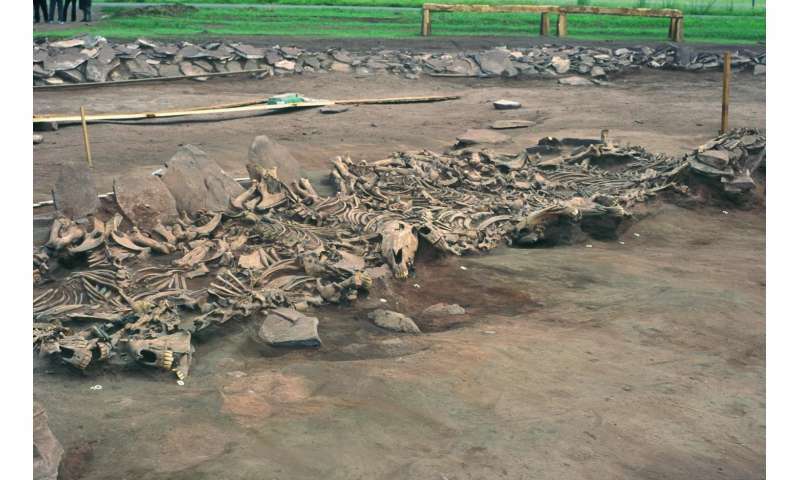 The authors also found that the demographic collapse and loss of Y-chromosomal diversity observed within the last 2,300 years was mirrored by a significant accumulation of deleterious mutations in the genome of the horse. As these mutations reduce the fitness of their carriers, it shows that the last two millennia of horse management have negatively impacted the horse. However, early domestication stages, as represented by the Sintashta and Scythian genomes, did not have such an impact. This contrasts with the Cost-of-domestication hypothesis, which posits a negative impact starting from early domestication stages. In the case of horse domestication, it is likely that the demographic collapse within the last 2,000 years reduced the efficacy of negative selection to purge out deleterious mutations, which could then accumulate in the horse genome. Finally, the researchers developed a novel statistical method to investigate the genome data for signatures of positive selection in early domestication stages. They found that the genomic regions showing the most extreme signatures were involved in the development of the neural crest, and expressed within tissues derived from the neural crest. "The neural crest hypothesis proposes a unified model for the origin of similar traits commonly found in most domestic animals. As the neural crest represents a temporary group of cells during development which gives rise to many tissues and cell lineages, selection for genetic variants affecting the neural crest can almost in one go co-select for a range of traits. The over-representation detected in our study supports the neural crest as key to animal domestication and to the rise of common domestic traits in independent animal lineages," concludes Professor Ludovic Orlando. Can aromatherapy calm competition horses? I suspect that settled climate is responsible for the focus on a reduced number of stallions that led to mutations. I suspect this is identifiable in humans also. As studies have shown. katesisco, if I correctly understand your contention that "settled climate' was a cause of the implosion of horse breeds among the Scythian's? I don't think I can agree. In my opinion, it is more likely that the need for larger mounts, robust enough to carry armoured men was what drove the later history of breeding. How did Scythians select from changes in embryonic equine embryos? Just by breeding more of the adult horses who showed nervous system traits that were all rooted in the neural crest? MC2 - Well, sorta. That's how it kinda filtered out over the centuries. However inadvertent the results. Mostly they were thinking, these are the horses I have available to breed, so let's get too it. Besides selecting for larger breeds to carry armoured men. There has always been selection for coat for looks. Each regiment wants their own distinctive herd. Bay or chestnut, sorrel or spotted and so on. A truly classical swindle, still practiced to this day. Is to come up with a pair or more of matching horses, 'Born To Run' and 'Born To Stumble'. You payover a treasure chest and two of your daughters for "Run". In the middle of the night, 'seller's remorse' sneaks in an steals 'Run' and leaves 'Stumble'. Another 'Oldie but still Goodie' is for you to race and win a couple of times with 'Run'. Then a big stakes race, you enter 'Stumble' while your friends are secretly betting against you. What a good sportsman you are to so graciously accept defeat.